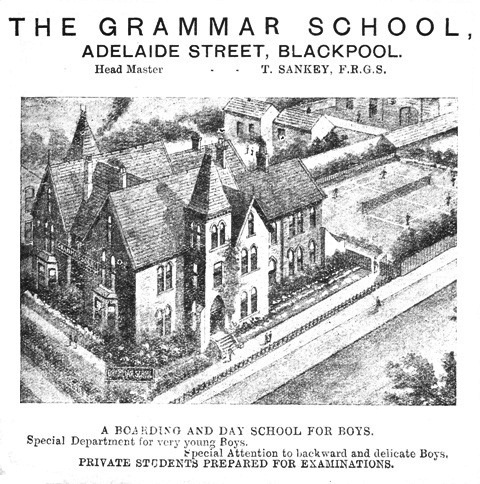 Advert for Blackpool Grammar School, Adelaide Street 1909. A private boarding and day school, headmaster T.Sankey, this is now the Comrades Club. Click here to view the building as it is today. The Grammar School in Adelaide street, Blackpool, is the oldest established private school in the borough. The school is pleasantly situated, and comprises a commodious house with large schoolroom, and four classrooms attached, a lawn, a partly covered playground, and a drill ground. The school provides a high-class modern education. suitable for a professional or commercial career, and. pupils are also prepared for entrance to the public schools and universities. Mr T Sankey is the headmaster, and his abilities are great as a teacher, as is exemplified by the success his pupils have achieved. Amongst the successes are scholarship and responsions at Oxford University. scholarship and junior freshmen at Dublin University, entrance examinations to Oxford, Cambridge, Durham, Dublin. Edinburgh, Manchester, and Birmingham Universities, London University Matriculation, Oxford and Cambridge Local and College of Preceptors' examinations, civil service. Pitman's shorthand certificates, and the preliminary examinations for law medicine, veterinary, dental, and pharma ceutieal Societies, science and art (Scott Kensington), etc. A prospectus can be had on application. The next term commences on Monday, September 13th. There as ample accommodation for boarders under the care of Mrs. Sankey, whom experience and careful attention for the health and happiness of "her boys" is so widely known and valued. Besides English boys, students from all parts are being educated at the Grammar School—from France, Germany, Spain, Portugal, Greece, Mexico. Brazil, and India—so that the reputation of the school is world-wide.